For my first piece of tech news, It’s reported that Samsung is eyeing the 24th of this month to unviel thier new Galaxy S5 smartphone to the public. Notice, I said unveil not release. 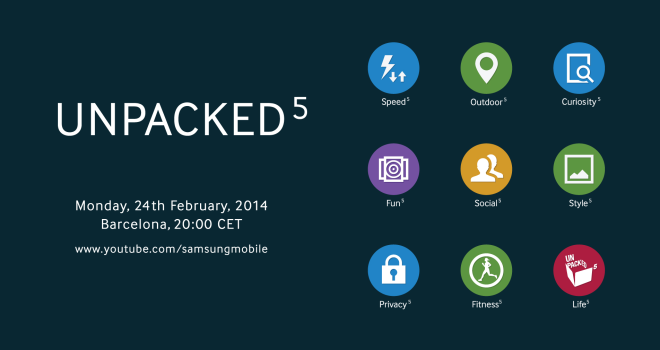 It might be revealed at Samsung’s Unpacked event in Barcelona, Spain. Samsung released the information on their blog today. It’s apparently a redesign of the phone’s TouchWiz User Interface. The teaser shows a grid of circular icons with a flat colour design, with looks alot like Apple’s iOS 7. Supposedly, the blue icons include Speed, Privacy and Curiosity, while green icons include Outdoor, Style and Fitness. About the Galaxy S5’s spec sheet, the New York Times’s sources are claiming that there be a minor update of the last model only with a faster processor and an updated version of its Knox security software.